Period Game Night, Sunday March 19 beginning at 5:00 p.m.
Garb is encouraged, but not required. Please feel free to bring any favorites if you have one. If the weather is cooperative we’ll likely have at least one Bocce match before we lose sunlight. If you’re so inclined, snacks or beverages to share are welcome (ingredients list for prepared items is requested). The location is home to four-legged-furry supreme overlords (i.e. cats) so please medicate if necessary. Please call Baroness Hedewigis at (302) 239-9787 if you have problems getting there. Address information is available on the Calendar entry. We are getting close to setting up our banner making day. I’m very excited about it, how about you? What size banner would you like? A small one the size of your outstretched arm or a larger, grander one? Do you have a frame? If so, what size? Please send your answers and details of your needs to Alejandro at yibachefonc@gmail.com by Thursday October 1, 2015 so I can start organizing this. Your participation is greatly appreciated. The date for banner making will be announced shortly. I’m so sorry to report that archery and thrown weapons practice is no longer going to be held at Padrig’s residence. 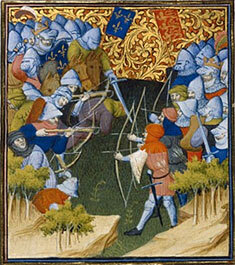 We will be looking for a new site, and all assistance would be appreciated. We truly appreciate the time and space, and big thanks goes out to Padraig for the many many years of service. ‘Stitch and Chat’ will be on hiatus for the summer due to scheduling conflicts, but will return as soon as possible. Join us for a special project that would be ideal for your garb, to be given as a present or just to learn how to do it! 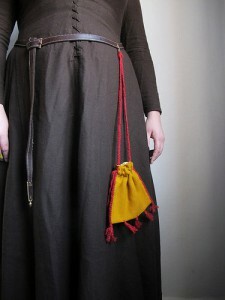 We will be making a Medieval Textile Belt Purse based on those worn in the 13th-16th centuries. It can be easily worn by women or men, depending on the fabric and embellishments, either over garb or under the top layer. Instructions can be found here. 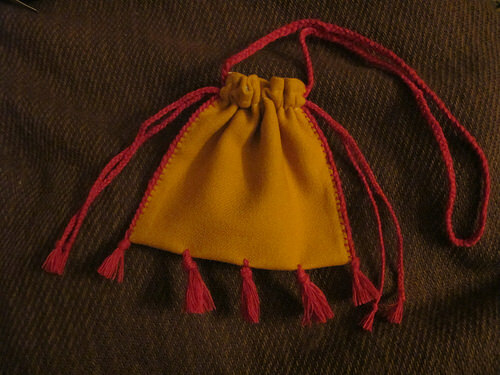 We won’t have time to complete the entire bag in one night, so we will be preparing the fabric, making the tassels and giving instructions on hand stitches and assembly as needed. Suitable exterior fabric – extant bags ranged from basic linen to elaborate embroidered silks and wools, so you can choose what suits you best. You’ll need 8″x14″ for this pattern. We will have extra linen for those that need it. 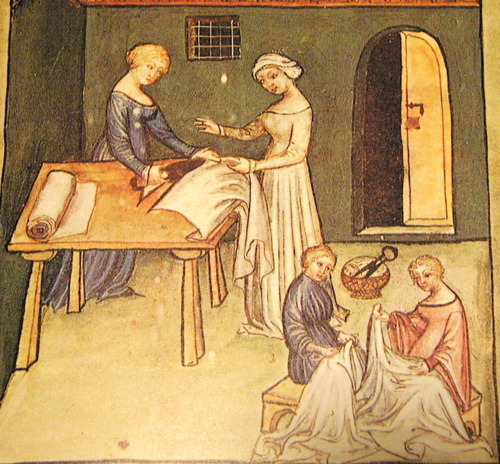 Lining fabric – linen or silk, same size to be trimmed down. We will have some linen on hand for this. *Please Park in back of housing development or in the shopping center, all spaces in front of houses are reserved for those houses.